Market Research iPad activations are a cost-effective and highly engaging way to build a customer database, obtain consumer feedback, and create loyalty with follow-up marketing. 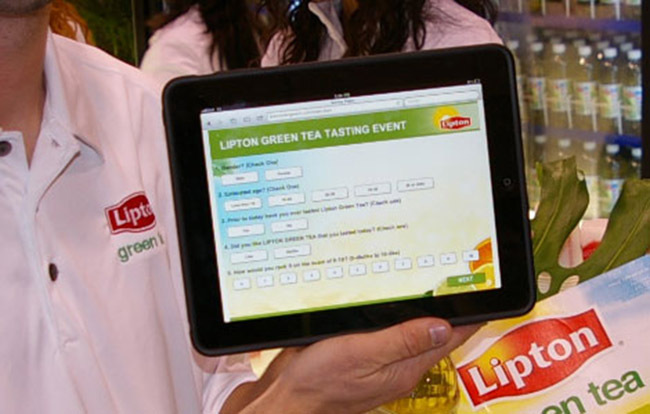 MOUSE developed a sampling campaign with customized iPad application to collect deep market research for Lipton to identify “first-time” trials, and gain a better understanding of taste profile likes, dislikes and purchase intent amongst key customers. Measuring and maximizing ROI is an important part of any activation. We identified that 94% of consumers engaged were among our target demographic, 85% of consumers engaged rated the new Lipton Green Tea product 8 or higher for taste profile, and 79% of consumers engaged indicated they were “very likely’ to purchase the product post the event. With a highly targeted audience of 22% who drink iced tea more than 4 times per week, we can ensure Lipton Green Tea is sampling the right people for greater sales results.